These applications are able to change the text into voice. 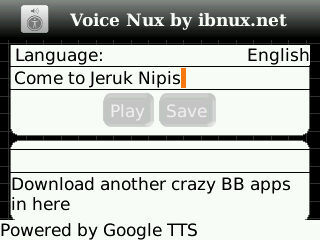 Application name is Voice Nux. This application was created by Ibn Maksum who has made a lot of light but very useful application. Voice Nux Applications very light, but very useful for those of you who love to create unique ringtone. The way it works is very simple, you just type a word of what you want to change into sounds, then select the type of language (newly available 3 languages​​, English, and Spanish), then click Play to listen or click Save to save a ringtone. You have finished reading Application - Change Text to Voice and many articles about Tech Gallery in our blog this, please read it. and url link of this article is https://littlebitjohnny.blogspot.com/2013/02/application-change-text-to-voice.html Hopefully discussion articles on provide more knowledge about the world of new tech gadgets.